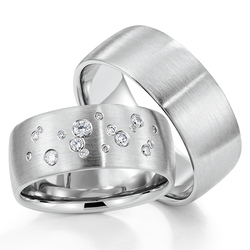 A favorite for couples who love traditional styles, this 8mm wide Diamond Wedding Band set is finished with round cut diamonds in burnish setting. Band is satin finish all around. Total Gram Weight*: 29.38 grams. Diamond size 1: 8 pieces x 1.0mm Round cut with Burnish Set - G/H Color - SI1 Clarity - 0.04 ct.tw. Diamond size 2: 2 pieces x 1.3mm Round cut with Burnish Set - G/H Color - SI1 Clarity - 0.02 ct.tw. Diamond size 3: 2 pieces x 1.5mm Round cut with Burnish Set - G/H Color - SI1 Clarity - 0.03 ct.tw. Diamond size 4: 4 pieces x 1.7mm Round cut with Burnish Set - G/H Color - SI1 Clarity - 0.08 ct.tw. Diamond size 5: 1 piece x 2.2mm Round cut with Burnish Set - G/H Color - SI1 Clarity - 0.04 ct.tw. Total Carat Weight: 0.21 ct. Ships Within: 3-5 Business Days. Please Contact us if you need it sooner. FREE lifetime re-polishing or re-finishing. FREE re-sizing up to 1 size and re-engraving within 60 days. Certificate of authenticity with each ring. Free appraisal with every diamond ring. Hallmark stamp inside the ring. Factory direct prices. Made in USA. Manufactured to your exact ring size, we do not re-size stocked items.